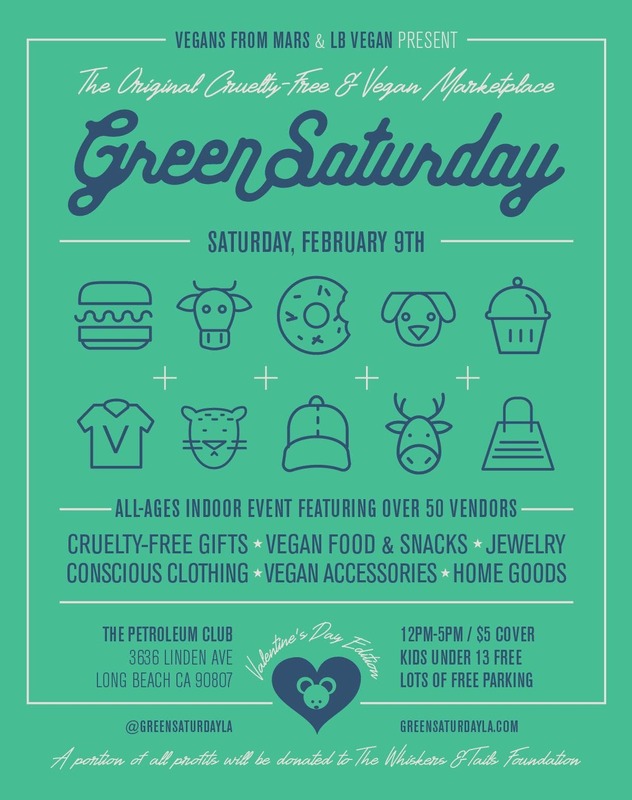 Green Saturday Marketplace is back at the Long Beach Petroleum Club, a spacious INDOOR VENUE (rain or shine! ), with a full bar, separate dining area and plenty of parking. Featuring 50 of your favorite Vegan & cruelty-free vendors! Delicious Vegan food, apparel, art, cruelty-free skincare, accessories, home goods, cosmetics, entertainment, animal adoptions & more! Looking for the perfect Vegan & cruelty-free gift for your Valentine? We’ve got you covered! *FREE GIFT BAGS! We’ll be once again be giving out free swag bags to early arrivals. Must be one of the first 30 adult attendees in line with a paid pre-sale ticket. One bag per person. This event will take place at the beautiful Long Beach Petroleum Club, conveniently located just off the 405 freeway and close to the 710 and 605 freeways in the Bixby Knolls area of Long Beach. As always, a portion of proceeds benefit the amazing Whiskers & Tails Foundation. They’ll be bringing some beautiful adoptable cats and dogs with them, so be sure to pay them a visit if you’re looking to give a companion animal a forever home.